Well, French Month is over already! There was much more I hoped to get through that I never had time for - some stuff about French consumer cooperatives in the Third Republic, a profile of some of the extreme liberal bishops recently appointed in various French dioceses, and an outline of Gallicanism. Alas, I got too bogged down in the Jansenism posts! Oh well! The Mandylion was perhaps one of the most revered relics of Christendom, and like many other relics, it made its way to France during the Middle Ages. The Mandylion (called in the East the Keramidion) was a small, rectangular piece of cloth upon which an image of Christ's face was imprinted. 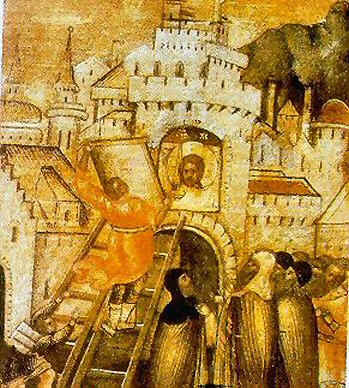 The orthodox , due to its great antiquity, considered it the first icon. "Blessed are you who hast believed in me without having seen me. For it is written concerning me, that they who have seen me will not believe in me, and that they who have not seen me will believe and be saved. But in regard to what you have written me, that I should come to you, it is necessary for me to fulfill all things here for which I have been sent, and after I have fulfilled them thus to be taken up again to him that sent me. But after I have been taken up I will send to you one of my disciples, that he may heal your disease and give life to you and yours" (Ecclesiastical History, I.13.9). It is not my intention here to comment on the probable historicity of this letter; if it is our Lord's, it is the only thing He left behind in writing that we possess. At any rate, Eusbius says this letter was carried by a disciple named Ananias. Later, after the Ascension, St. Thaddeus came to the court of Edessa and healed Agbar as promised by our Lord. There is no mention of an image here, nor in the diaries of Egeria (c. 380), when Edessa and the Agbar legend is mentioned again. The first mention of an image in Edessa comes from the Doctrine of Addai, written around 400. In this account, the messenger sent by Agbar to Jesus happened to be a painter and made a painting of Jesus based on His likeness, taking it back to Agbar who received it with joy. The image was later transferred to a chamber within the wall of the city gates of Edessa, where it was believed that it would draw down the mercy of the Lord in defending the city. Later (c. 593), Evagrius Scholasticus called the image "God-made", suggesting it was supernatural in origin. From 609 to 944 Edessa was under the control of first the pagan Sassanids and then the Muslims, and accounts of the image dry up. In 944 the city was conquered by the Byzantines and the image suddenly reappeared, presumably having been kept hidden for the last three centuries. It was removed from Edessa to Constantinople where it was placed in the royal palace chapel by Emperor Romanos. Once we trace the image to Constantinople, we can see how the French will play in to this. Of course, Constantinople was taken and sacked by French-Norman crusaders during the Fourth Crusade in 1204. At this time, the Mandylion and the Shroud of Turin were both taken from the Orthodox and made their way west, and the Mandylion was passed to St. Louis IX of France by the Norman King Baldwin II of Constantinople in 1241. There is some evidence that it passed through the hands of the Templars as well. The saintly King of France placed the holy relic in his famous Sainte-Chapelle, the chapel he completed in 1248 that contained some of the most wonderful relics in Christendom, including the cape of St. Martin, the Crown of Thorns, the True Cross, the Lance of Longinus, and many other relics of Christ and the Apostles and even some clothing of the Virgin Mary. These relics were the common patrimony of the French kings until the Revolution of 1789, when they met a similar fate as the relics of Joan of Arc. The scattered relics that survived were handed over to the Archbishop of Paris during the Napoleonic era, but the Mandylion never resurfaced. The Vatican exhibits an image that many claim to be the Mandylion of Edessa, but it's connection is not certain; it is definitely possible that the sacred Mandylion was spirited away to Italy during the Revolution, but there is no way to be sure. Finally, we come to the conclusion of this tangled and twisted heresy, this odd school of thought which began on the theoretical level with speculations about grace and will and ended in very practical denials of the Roman pontiff's ability to evaluate and pass judgment on the teachings of theologians - in effect, a denial of the teaching power of the Church. Last time, we saw how the compromise offered to the Jansenists by Clement IX was ruptured in 1705 with the renewal of the controversy, the fierce persecution of the Jansenists of Port-Royal by an aging (and increasingly pious) Louis XIV and the publication of the bull Vineam Domini Saboath, which stated that "respectful silence" in the face of the Church's teaching was no sufficient if that silence entailed an internal dissent. The final phase of the Jansenist controversy erupted over the bull Unigenitus. Back in 1671, an author named Quesnel had published a book entitled The Morality of the Gospel, which was basically a commentary on the four Gospels. This book was followed by the French New Testament in 1693, which was heavily footnoted by Quesnel. Upon inspection by ecclesiastical authorities, it became apparent that both The Morality of the Gospel and Quesnel's New Testament footnotes were ridden with Jansenist propositions. The pope condemned the writings in a brief of 1708, but the brief proved very unacceptable to the French church because it also condemned what were known as "Gallican liberties," alleged rights and prerogatives exercised by the French church uniquely, giving it a special degree of independence. The popes had fought the alleged Gallican liberties, but again not wanting to face off against Jansenism and the French clergy at the same time, Pope Clement XI, at the behest of Louis XIV, drafted a bull that would condemn Jansenism without reference to any of the Gallican liberties. The result was the bull Unigenitus of 1713. From these condemned propositions, we can see that the Jansenists were an odd combination of Catholic Puritan-Calvinists and rigorists in the spirit of the Donatists and the Montanists. The bull was accepted in France, but an important ecclesiastic, Cardinal Noailles, Archbishop of Paris, tried to prevent its universal and unqualified acceptance by the French clergy. Noailles was an opponent of the Jesuits, a sympathizer with the Jansenists (though he condemned them publicly), and a friend to both Fenelon and the influential Lutheran Ludwig von Zinzendorf. Noailles was to be summoned to Rome by Clemen XI to answer for his disobedience, but many in the French clergy protested vehemently that the removal of the Cardinal to Rome for judgment would be a violation of their Gallican liberties. Louis XIV begged Clement to allow a national French council to pass judgment on the Cardinal. Instead, Clement drafted two briefs, one very severe, and one more paternal in tone, and delivered them to Louis XIV, asking him to present to Noailles whichever one seemed best depending on the Cardinal's disposition towards the Holy See. Louis vacillated, however, and neither of the briefs had been delivered at the time of his death on September 1, 1715. The new regent, Philippe II, Duc de Orleans, opposed the bull Unigenitus, not because he was a Jansenist, but because he saw it as an erosion of the liberties of the Gallican church. He refused to censure Cardinal Noailles and convinced the Sorbonne to revoke their support of the bull. The Universities of Nantes and Reims now also rejected the Bull. In consequence Clement XI withdrew from the Sorbonne all the papal privileges which it possessed and attempted to deprive it of the power of conferring academic degrees. The Jansenist controversy was morphing into a dispute about the rights of the French church. As Clement XI worked tirelessly for the submission of Noailles and the unconditional acceptance of the bull, four more bishops joined Noailles in his protest; in 1717, they appealed the judgment of Pope Clement XI to a future ecumenical Council and a future pope, taking the name "appelants" and trotting out the Conciliarist decrees of Constance and Basel in support of their position. This right of appeal to a future Council was one of the main points of the Gallicanists - that the pope was not the final arbiter in any dispute, as one could licitly deny the pope obedience if there was good reason to believe that his disciplines would be overturned by a future council (the same argument used today by proponents of contraception and women's ordination within the Church; "this is going to change one day, so it's alright to dissent right now"). Ten more bishops joined the resistance over the summer of 1717, and more than 2,000 priests, especially from the vicinity around Paris. The church in France seemed to be in general revolt. Clement fought back. In March, 1718, he condemned the appeal of the bishops as heretical. That summer he issued a bull (Pastoralis Officii) excommunicating anyone that refused to accept the bull Unigenitus without reservation. The enforcement of this bull was very strict; interdict was even used in some places, and there are stories of loyal bishops commanding that no person in his diocese could receive baptism or last rites unless they swore an unqualified oath of submission to Unigenitus. In the end, the Vatican made use of one of its most potent weapons: time. Resistance to the bull gradually wore down. As Noailles got older, and as the rest of the French clergy began to submit rather than face excommunication, he pledged a vague submission to Unigenitus in 1720. In 1728, on his deathbed, he made a sincere and unqualified submission. By this time Unigenitus was accepted universally throughout France and Jansenism seems to have died out, at least in France. To things to note here: first, we must point out the role of the Jesuits in the Jansenist controversy. Throughout these years, the Jesuits were consistently opposed to the heretics at every turn, constantly frustrating their attempts to overturn papal authority and overthrowing their sophistic arguments. This earned the Jesuits the unceasing ire of the upper class Parisian intelligentsia who tended to support the Jansenists. In the following generation, the philosophes, many of whom were sympathetic to the Janesenists of who themselves had drank from the waters of Port-Royal, attacked the Jesuits with unrestrained hatred. The Jesuits were of course suppressed in France in 1764. Thus, we can see the Jansenist controversy as the backdrop to the later attacks against the Jesuits. Second, some have said that the prolonged Jansenist controversy, with its convoluted arguments against legitimate authority, its demands of appeal to future popes and councils, and its insistence on the unique rights of the Gallican church independent of the universal Church, inculcated in the French a spirit of resistance to authority that festered and blew up during the Revolution. I think this is at least remotely plausible - a spirit of resistance to authority, once unleashed, is very seldom restrained. I don't think there is a direct link, however. Thanks for your patience in journeying with me through this mess of distinction, counter-distinctions and ever morphing lines of argumentation. Last time we dug into the origins of the Jansenist controversy in the disputes of the relation between will and grace. It is very interesting to note how what was originally a theoretical dispute about grace transformed into a very practical argument on the powers of the papacy to understand and proscribe certain errors in the works of theologians. As a historian, when I study the Jansenist controversy I am much more interested in these disputes over matter of right and matter of fact than I am about the actual content of the Augustinus and the doctrines of the Jansenists. The Jansenists could not have maintained their opposition to the Church's authorities for so long had it not been for the unique pool of polemical and literary talent centered on the convent of Port-Royal, which became the Jansenist stronghold in France. Port-Royal, just on the outskirts of Paris, was founded in 1204 as a convent of Benedictine nuns. Discipline at the abbey declined during the age of the religious wars; during the reign of Henry IV, the rank of abbess was even bestowed on an eleven year old girl! In the early 1600s, however, the convent got caught up in the post-Tridentine spirit of reform and adopted the strict observance of the Cistercian rule. The number of nuns went from 12 to 100 and the pope, at the behest of the king, removed Port-Royal from the jurisdiction of Citeaux and placed it under the authority of the Archbishop of Paris. The nuns became known for their piety, and man lay persons, of the higher and lower ranks, began to set up cottages and temporary homes outside the Port-Royal convent to breathe the same air of piety as the nuns. Nobody, even the most vehement opponents of Jansenism, deny that a genuine spirit of piety pervaded the convent. It is quite unfortunate, however, that in 1633 the nuns adopted as their patron and spiritual guide one Jean du Vergier de Hauranne, Abbé de Saint-Cyran. The Abbé de Saint-Cyran happened to be the best friend and first promoter of Cornelius Jansen; the two had been in seminary together and he had encouraged in latter in his composition of the Augustinus. In addition to the typical Jansenist views on grace, the Abbé de Saint-Cyran also taught that perfect contrition was necessary for salvation, rejecting the Church's teaching that imperfect contrition (also called attrition) would suffice. Under the leadership of the Abbé de Saint-Cyran, the nuns gradually adopted the Jansenist heresy and Port-Royal became a center of Jansenism for the next three quarters of a century, attracting great minds liek Pascal to their community, but also most of the snobbish intelligensia who saw dissent from ecclesiastical authority as a mark of high society. 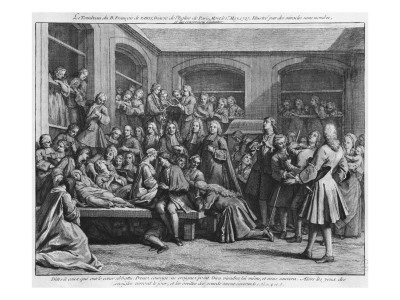 In the wake of the Jansenist dissent from the formulary of 1665, Louis XIV inaugurated a fierce wave of political repression against the Jansenists - some were exiled to distant parts of the kingdom, all Jansenist schools were closed, some leaders were imprisoned, the nuns were forbidden to profess novices or admit new novitiates; several nuns were displaced and moved to other convents. All adherents to the movement were banned from court, and some Jansenist leaders, under force, were compelled to sign the formulary of 1665. It was this persecution (which lasted until around 1669) that led Pascal to compose his famous Lettres Provinciales, attacking the moral formation of the Jesuits and attempting to exonerate the Port-Royalists. The Port-Royalists were aided by four recalcitrant French bishops, who refused to sign the formulary of 1665 and who openly opposed both the pope and King Louis XIV in his suppression of the Jansenits. Louis threatened to deprive them of their temporalities and increase the political persecution on the Jansenists. Fearing a general breakdown of the situation, Pope Clement IX sent his nuncio Pietro Bargellini to Paris to assess the situation and work out some sort of satisfactory solution to the impending schism. Bargellini worked tirelessly with the French foreign minister Hugues de Lionne (successor to Cardinal Mazarin) to come up with a compromise that would satisfy both parties. The result was what came to be known as the Peace of Clement IX or the Clementine Peace. That the peace was a compromise, nobody denies; yet, it was a compromise that Clement IX deemed acceptable in the face of what could become a full-blown schism. According to the terms of the peace, Jansenist bishops would agree to sign the formulary of 1665 without reservation. In exchange for their signatures, the pope spared them the humiliation of having to publicly renounce their errors. In other words, the Holy Father allowed them to simply sign their assent to the formulary without formally recanting anything, on the understanding that they would maintain a respectful silence on the controversial propositions.The nuns of Port-Royal were also included in this amnesty. The peace endured for a generation, but it had one very serious flaw in that it was not defined what "respectful silence" inferred. Clement IX had assumed, that since the bishops had signed the formulary, that the permitted silence was simply a gesture to help the French bishops save face by not having to humble themselves publicly. The pope had assumed that the bishops had in fact rejected Jansenism internally and did not interpret the permitted silence in any other way. The Jansenists, on the other hand, interpreted the permitted silence to mean that though they had signed the formulary out of obedience, they were still free to internally dissent on these points so long as they did not make their views known publicly. "[T]he respectful silence, by which the Jansenists sought to dispense themselves from condemning, internally, the sense of the Augustinus, as heretical, was only a deceitful veil to cover error, instead of renouncing it...By respectful silence, a person did not satisfy the obedience, due to the apostolic constitutions, against the book of Jansenius; but that all the faithful of Jesus Christ should condemn the propositions as heretical; and reject, not only by mouth, but also with the heart, the sense of the book of Jansenius, condemned in the five propositions; and it is declared to be unlawful to subscribe the formulary of Alexander VII with any other mind or sentiment." (Vineam Domini Sabaoth). As an aside, this bull is a good source to go to when talking with progressives who claim the Church allows internal dissent so long as the dissent is not given public voice. Clement XI clearly says it is not so. The bull was registered by the French parliament and accepted by the clergy of France. Yet the Jansenists tried to make yet another distinction to avoid submission: The bull, they argued, had not decided the issue. They readily admitted that respectful silence was not true obedience when it concerned matters of faith; but the real question, as the Jansenists put it, was whether respectful silence was sufficient when dealing with matters of fact. The bull had not addressed this issue, and therefore the Jansenists said they were in the right to continue their dissent on the issue of whether or not the condemned propositions actually occurred in the Augustinus. One wonders, if the Jansenists fought so hard to claim that the condemned propositions were rightly condemned but not found in the Augustinus, what propositions were they fighting for? Louis XIV was extremely irritated and renewed the persecution, this time centering on the nuns of Port-Royal. The authorities came with carriages to disperse the nuns to different convent and the abbey itself was demolished. The grounds were turned up, gardens demolished and even the bodies of the dead dug up and removed. The physical center of Jansenism had been destroyed, although many of the Jansenist clergy and their supporters remained obstinate. We'll conclude this series on Jansenism next time with a history of the controversies surrounding the bull Unigenitus. What is Jansenism? One cannot discuss the history of the Catholic Church in France without mentioning this heresy, which rent the French church from 1652 almost until the Revolution. The interesting thing about Jansenism is that it is so little understood, even by educated Catholics. We all know of the epic battles of St. Athanasius against Arius, and in doing so comprehend what the heresy of Arianism was, exactly. Likewise, most of us are acquainted with the beliefs and oddities associated with the Cathar-Albigensian movement in medieval France, simply by virtue of their strangeness, if nothing else. But how many of us are really well versed in the complexities of the Jansenist controversy? Who was Cornelius Jansen? On what point of dissent did the Jansenists take their stand, and why did the Holy See go to such extreme lengths to crush this obscure heresy? The problem with Jansenism is that it was concerned with one of the most complex areas of Catholic theology – that of the interaction between free will and grace. To an uneducated layman like myself, this branch of theology seems incredibly complicated and I think it wisest (for myself at least) to maintain an attitude of humility when dealing with these mysteries, lest I forget myself and try to arrogantly understand the deep things of God. I do not think I am mistaken in saying many Catholics feel the same way about these questions of free will and grace; content with a few definitive truths to serve as guide posts along the road, we leave the more intense exploration of these realms to greater intellects than ourselves. The Jansenist controversy can be divided roughly into two phases – first, the controversy surrounding the work Augustinus published by Cornelius Jansen; second, the controversy aroused by the publication of the bull Unigenitus, which put the nail in the coffin on Jansenism. In this post, we will look at the origins of Jansenism and the book Augustinus. But before we even proceed to this, I think we ought to remind ourselves of the two extremes that we are in danger of falling into regarding free will and grace – one is that of Pelagianism in assigning too great a role to free will and debasing God’s grace; the other, of course, is that of Calvinism, in which free will is negated and the operation of grace inflated to the point that we arrive at total (or double) predestination. These extremes are the Scylla and Charybdis of the theology of grace; a truly Catholic approach to this problem must sail skillfully between these two dangers, turning neither to the left nor to the right. 1) The grace merited by Christ is necessary for us for all actions of piety and the exercise of every virtue and should be asked of from God. 2) With the help of grace, all the commandments of God are possible to obey, such that a chaste and holy Christian life without mortal sin is possible. Without grace, activity in the order of salvation is not only more difficult and laborious, it is altogether impossible. Furthermore, without this grace, we nor even persevere in sanctity. 3) Grace prevents and aids our wills in such a way that we owe our salvation to God’s grace; if we do fall, it should be imputed to ourselves. 4) Grace strengthens and supplements our freedom, but in no way destroys it. 5) While maintaining the existence and freedom of the will, we should nevertheless remain in a posture of humility, remembering that our will is aided by grace in ways we don’t understand. Beyond these five points, I think the Catholic layman ought not to probe too much – let us be humble and content to admit our ignorance on some of the more intricate questions here. I believe I have presented the Catholic teaching here accurately, but I confess my ignorance on this branch of theology and welcome any correction on this point. In the years leading up to the Jansenist controversy, the views of Catholic theologians had been divided between several schools; the most pertinent regarding the Jansenist controversy was between the school of Michael Baius (Michael de Bay), who, citing St. Augustine, tended to favor grace excessively, and those of the Spanish Jesuit Molinos, who opposed Baius fervently and tended to favor free will. The disputes between these two parties led to Paul VI summoning a congregation of cardinals in 1607 (The Congregation de Auxiliis) in which it was decreed that the Dominicans and Jesuits were to reconcile their differences, adhere to the established teaching of the Church while allowing for diversity of opinion on those points still left open to dispute, and to refrain from censuring and attacking each other. Beyond this, much of the matter of the dispute was left open. Baius, while not condemned by name, had several of his propositions condemned from erroneous to heretical and was ordered to recant them, which he did, although many of his errors would later be found in Jansenism. Thus, there was already a ripe tradition of debate on this issue by the time we get to Cornelius Jansen, bishop of Ypres in Flanders. Jansen favored Baius in the dispute and, to lend support to these opinions, wrote a treatise on the issue of grace entitled Augustinus, which purported to be a compendium of the teachings of St. Augustine of Hippo on the subject. This was meant as a vindication of Baius, who had also defended his heretical positions based on Augustine. Augustinus was a truly massive work. According to Jansen, he had worked on it for twenty years and had reread everything written by St. Augustine thirty times (how many of us will even read all of Augustine’s writings one time? ); Jansen fell ill and died as the work was being completed, however. It was submitted with unqualified humility to Pope Urban VIII by two of Jansen’s followers in 1640. It only took the Holy See one year to condemn several propositions found in the work. Pope Urban VIII declared that the work Augustinus contained many scandalous and heretical propositions already condemned by his predecessors (especially Paul V, St. Pius V and Gregory XIII). These condemnations were published in a bull dated March, 1640. Despite this, there was some discussion in France and Belgium on the matter, with debates continuing, though none of them arousing much attention from the papacy and with a spirit of obedience as the followers of Jansen attempted to reformulate his works in a more orthodox manner. 1) That some of the commandments of God are impossible to just men, even when they strive to fulfill them, because the grace to fulfill them is not given. 2) In fallen man, nobody can ever resist an interior grace. 3) To merit or demerit in our current, fallen state, it is not necessary for us to have a freedom defined as freedom from necessity; mere freedom from constraint is sufficient (I personally don’t understand this distinction – if anybody out there does, please clue me in). 4) Human nature has the power to resist or obey God’s law without any interior or preventing grace. 5) Jesus Christ did not die or shed His blood for all men, but only for the elect. It should be noticed, especially in the second and final points, that Jansenism held some things in common with Calvinism. This is not surprising, since Calvinism and Catholicism had coexisted side by side in an uneasy truce since the Edict of Nantes (1589). It is not unreasonable to suppose some Calvinist influence in those French supporters of Jansen who helped to develop his system. Pope Innocent X condemned these five propositions in 1653 after they were submitted to the Holy See by an assembly of eighty-five French bishops. The bull condemning them was widely accepted throughout France and Flanders. However, this of course did not put a halt to the Jansenist heresy, but rather gave rise to its next manifestation – the debate between matter of right and matter of fact. Recall that the five condemned propositions were not extracted from the Augustinus verbatim; rather, they were summarizations of the theological system put forth in the work, based on the opinions of learned theologians and bishops who had scrutinized it. Thus, when the bull condemning the five propositions was issued, the Jansenists made the argument that, while the pope was certainly right to condemn the five propositions, this did not imply a condemnation of Augustinus itself, since the pope could not prove that those five propositions were actually found in the book. Thus, the five propositions were justly condemned, but the bull did not state, and hence did not require the faithful to believe, that the condemned propositions were actually contained in the Augustinus in the form in which they were condemned. The condemnation of heretical principles was called the matter of right, but the question of whether or not these principles actually appeared in the Augustinus was called the matter of fact. It was now established that the five propositions were found in Augustinus. However, it was asserted that the Magisterium could only rule definitively on the content of divine revelation. The content of a particular book, the existence of a proposition in a book, or the interpretation of the content of any book, could in no way be said to be a revealed fact. Therefore, the Church lacked authority to infallibly judge the content of any book. Based on this, the Jansenists maintained that the proper response to the papal condemnations of the propositions was a “respectful silence.” In other words, the faithful were free to dissent from these judgments so long as their dissent was respectful, silent and did not attack the authority of the pope. This was actually a pretty clever argument – the pope’s job is to interpret and preserve divine revelation, and since a book by a theologian is not divine revelation, the pope possesses only a human prudence in judging such works and theological censures, such as those surrounding the Augustinus, could be at best only the judgments of the pope as a private theologian, but not as the infallible Universal Pastor. “The Church, having received so many explicit commands to reprehend, to censure, to note heretical persons, is frequently obliged to take cognizance of certain facts, and to judge them definitively. Thus, when a particular bishop, or a particular doctor, is accused of having taught verbally, or in writing, a suspected doctrine, it belongs to the office of the Church to decide, not only whether the doctrine be in itself good or bad, but whether it be true that such and such a person has taught it, or that it is contained in such and such a book. After pronouncing on the doctrine, it is her office to judge definitively on the fact; and to condemn publicly the bishop, the doctor, or the book, as teaching a bad doctrine: it is equally her office to designate the doctrine. This is a constant truth: every person must see, that, to take this authority from the Church, is to expose her, naked and disarmed, to false teachers, and to render useless the repeated commands, and the repeated warnings which have been given to her to guard herself against them by every precaution. In effect, all the world knows that the Church has never failed to observe this command when occasion required. She has made her children see, of what importance to her, such judgments are, by two remarkable circumstances; the first, that, after she has passed sentence on innovators, she has often inserted their names in her solemn profession of faith; and, secondly, even after persons have condemned the error noted by the Church, she has denied them her communion, if they refused to subscribe to the condemnation of the persons whose errors were condemned” (Bishop Jacques-Bénigne Bossuet, Letter to the Nuns of Port-Royal). If the excuses of the Jansenists were clever, the response of Bossuet was ingenious. The argument is two-fold: in the first place, since the separation of truth from error is essential to the mission of the Church, as St. Paul warns Timothy, “Guard that which was entrusted to you,” (1 Tim. 6:20) the power to rightly, accurately and authoritatively discern truth from error in the writings of theologians can be said to be inferred in the Lord’s command to the Apostles “Teach them to observe all the things I have taught you” and His promise that “whatever you bind on earth will be bound in heaven.” This could also be inferred in His words to Peter, “Feed my sheep,” since to feed the sheep the food of truth, the Church must be able to discern truth from error; and this not only in the abstract, but in the concrete, as it appears in the books of theologians. The second argument is even more ingenious, for here Bishop Bossuet appeals to the liturgy of the Church, thus connecting the very practical issue of the teachings of individual theologians with the timeless liturgy of the Church, which is ever the Rule and Preserver of the Faith. Since the founders of heresy had been named in liturgical formularies and oaths (“I reject the heresy of Arius”, for example), it is evident that, in this example, Arius must actually teach the heresy attributed to him. Furthermore, the practice of removing these persons from communion indicates that these individuals must actually be guilty of teaching the things they are accused of – otherwise, the Church’s censure of excommunication for heretics makes no sense and has no teeth. This is enough for now…next time we’ll see how the controversy escalated, the lull brought about by the peace of Pope Clement IX restored peace to the French church, and then how it all blew open again (click here for Part 2!). Sorry to disrupt the flow of French month with a non-France related post, but this is important as it concerns the website edition of this blog that I have been trying to get up and running all spring. As of now, the backbone of the new site is up, domain name is registered (www.unamsanctamcatholicam.com), but nothing is up yet. In the coming months, I will be working on artwork and content. In the first place, I am putting out another call for potential contributors. Whether you have your own blog or just like to write? I am look for two or three contributors to write articles on the new website. The content can be just about anything: economics, history, theology, liturgy, apologetics, almost anything as long as it is from a Catholic point of view. Articles must be written well and properly cited, if you use quotes. Second, the new website will have a store, but I want to make it a very unique store where there are a lot of good, quality books and such that cannot be purchased elsewhere, especially well-done, self-published works. Do you have a self-published book on a Catholic related topic or know somebody who does? Or maybe you know of a book that has already been published but is very obscure or has been blacklisted from mainstream publishers. If you know of anything like this, please bring it to my attention for possible inclusion into the store. Unpublished dissertations and master's theses are also good sources that can be turned into books easily. Finally, if you do art or are proficient in Photoshop and would be interested in contributing something to the new site, please let me know - there will be plenty of opportunities. Thanks everybody for patronizing this blog and encouraging me in this endeavor. If you want to volunteer to help, leave your contact information and a brief summary of what you'd like to do in the com-box (I won't publish them). Are you utterly sick of books, movies and even quasi-historical works which make the unfounded assertion that in the old days the Catholic clergy in Europe were ignorant, superstitious and of low morals? I can't even begin to say how many times I have seen this assertion made (without any evidence, of course). Though there are always bad apples, by and large this stereotype is simply false. The clergy were some of the best educated men of their age; this is especially true in the post-Tridentine age. I would love to collect some more data on this, the general state of the clergy at various times in history. Since this is French month on this blog, let's look at the French clergy during the 17th and 18th centuries, the reigns of Louis XIV, Louis XV and Louis XVI, a time that is especially important since, according to the popular mythology, the Church was ignorant, corrupt and out of touch with the Masses; indeed, the alleged neglect of the ecclesiastical order to the sentiments of the people is usually put forward as one of the factors which led to the French Revolution. Fortunately, there is ample evidence surviving from the period in question to debunk this myth. Take this quote from English diplomat Edmund Burke, taken from Reflections on the Revolution in France, c. 1790. Now, remember two things as you read this: (1) Burke is an English Protestant, with a reputation for objectivity (2) According to secular history, the pre-Revolutionary period in France was one of widespread corruption and ignorance. Therefore, we should expect the clergy in this period to be extra devious. You had before your revolution about an hundred and twenty bishops. A few of them were men of eminent sanctity, and charity without limit. When we talk of the heroic, of course we talk of rare virtue...if this letter should ever come into their hands, I hope they will believe there are those of our nation who feel for their unmerited fall, and for the cruel confiscation of their fortunes, with no common sensibility." "I know many of these good country curates. Notwithstanding the extreme modicity of their livings, they find means of doing infinitely more good, than possessors, however generous, of millions. Their judicious and active charity creates for them a thousand resources. Their lives are innocent; their manners decent: they live far from the noise and notice of the world. Unknown, forgotten and content, their lives pass in the practice of the duties enjoined by the Gospel. How pleasing it is to me to render, thus publicly, justice to a portion of men, I so greatly honour!" (Quoted in Charles Butler, Church of France, Hansard & Sons, 1817, pg. 221). This passage is especially important since it speaks to the moral virtues possessed by the clergy. The clergy of this period are often presented as immoral, especially in France, with all the stereotypes of the rich, uncaring bishops and the ignorant, immoral and adulterous priests. Mercier's passage, on the contrary, presents them as the unparalleled lights of French society, full of virtue and charity, who were nevertheless unrecognized even in their own day. Mercier's accounts are generally considered very trustworthy on such matters; modern French historian Robert Darnton says of Mercier, "There is no better writer to consult if one wants to get some idea of how Paris looked, sounded, smelled, and felt on the eve of the Revolution." "This prelate was very learned, and particularly skilled in theology. His possessed wit, firmness of character, and elegance...His disinterestedness, piety, and rare probity were his only lustre. His conduct, doctrine and discharge of episcopal duty were irreproachable; his visits to Paris were both few and short" (ibid., 19). "The person who took the news of his nomination to the bishopric of Chartres found him on his knees before a crucifix, in a small room, all the furniture of which consisted of a chair, a table, and a map of the holy land. He was only induced to acquiesce in his nomination by the order of his superiors. In 1693, the poor of his diocese being in great distress from a scarcity of provisions, he assigned over to them, without reserve, the whole of his revenue. All his stock of plate consisted of a single spoon, and a single fork; and these he once sold to relieve a poor man. Louis XIV wished to appoint him counselor of state and to nominate him to the rank of cardinal: he refused both dignities. He preached frequently and was little praised, though he made many converts to virtue. His letters to Louis XIV and other sovereign princes (to the pope, to the King of Spain) were worthy of the first ages of the Church." "Never did the clergy of France display greater dignity of conduct, or more exalted talents, than under Louis XIV. A considerable number revived in themselves the zeal and profound doctrine of the fathers of the Church, uniting the inspired tone of the sacred writings with a happy imitation of the best models of antiquity, and enforced their authority still more by their virtues than their writings" (Histoire de France durant le dix-septieme siecle livre, 4). "In the missions among the villagers...we find truly apostolical men, and real orators, gifted with a strong and bold imagination, acknowledging no other success than the conversions of repenting sinners and no other applause than their tears. Occasionally they fail in taste and descend into too familiar details, I admit it; but, they open a breach; they force their way and place themselves in the midst of conscience. They inflame the imagination, but they forcibly strike the senses. But the multitude follows and listens to them with enthusiasm" (Essay on the Eloquence of the Pulpit, 20). Any age has its ignorant, dissenting or immoral priests and prelates; witness some of the poor examples just within the hierarchy of the United States. But to portray the French clergy of the Ancien Régime as wholly inept, worldly and unconcerned with their spiritual duties is a vast distortion of history. There are always tares along with wheat in the field of the Lord, but in France, just as anywhere, the truths of the Gospel never ceased calling men and women to live lives of radical dedication to our Lord in piety and holiness. Are there any relics of Joan of Arc? St. Joan of Arc is undoubtedly one of my favorite saints of all time. The more I study her, the more I am convinced that her story is one of the most amazing, miraculous accounts in all of human history. I confess that there have been many times when I have been brought to tears reading the excerpts of her trial or contemplating her virtue - in the holy Maid of Orleans one truly understands what it means to say that the beauty of a soul transfigured in Christ's image is the most perfect and beautiful thing this side of heaven. There are other saints who did greater works than she, were more learned than she or perhaps holier than she, but the great drama of her life and death, the exceptional wit and wisdom she displayed before her captors and the astonishing degree of virtue she displayed in all her undertakings put her in a category apart. The Catholic Church recognizes two orders of saints - the Blessed Virgin, who alone is worthy of hyperdulia, (literally "super veneration") and the rest of the saints, those who receive dulia (veneration). But for me, there are three classes - there is the Blessed Virgin, Joan, and then everybody else. Seeing that Joan is such an exceptional saint, it is interesting to ask if there is any altar or shrine upon this earth where we can go and venerate the relics of this holy martyr. Are there any relics of St. Joan of Arc left? The answer is yes and no. Yes, a good number of relics of St. Joan of Arc did survive after her execution in 1431, but not of the first class; since she was burned at the stake, and at the time was condemned as a witch and a heretic and not exonerated until a generation later, there are no physical remains of her body. However, many second-class relics, objects which St. Joan touched or wore, survived and were venerated very highly in France for the next several centuries. "[The standard] remained [in the cathedral of Orleans] for three hundred and sixty years, and then was destroyed in a public bonfire, together with two swords, a plumed cap, several suits of state apparel, and other relics of the Maid, by a mob in the time of the Revolution. Nothing which the hand of Joan of Arc is known to have touched remains in existence except a few preciously guarded military and state papers which she signed, her pen being guided by her clerk or her secretary...a boulder exists from which she is known to have mounted her horse when she was once setting out upon a campaign. Up to a quarter of a century ago [c. 1860] there was a single hair from her head still in existence. It was drawn through the wax of a seal attached to the parchment of a state document. It was surreptitiously snipped out, seal and all, by some vandal relic-hunter and carried off. Doubtless it still exists, but only the thief knows where" (Mark Twain, Joan of Arc (Ignatius Press: San Francisco, 1988), pp. 314-315). The French Revolutionaries committed many crimes and blasphemies - the beheadings, the regicide, he smashing of churches, killing of priests and nuns, worship of Reason and much more. But the intentional destruction of the relics of St. Joan of Arc, by the French themselves, is a shocking display of ingratitude and, in my opinion, a sin that cries out to heaven for vengeance; it would be as if the Irish should someday rise up in atheistic fury and cast the bones of St. Patrick into the sea. On the Day of Judgment, though the Revolutionaries will be found guilty of many things, I think this destruction of her relics is what the French Revolutionaries will be ashamed of most when they behold her in glory standing behind the throne of God with all of the other saints and angels. There is a helmet in the New York Metropolitan Museum of Art that may have been worn by Joan, but it is not provable. The same is true of a sword kept in the Museum of Dijon in France. A charred bone fragment kept for years in Chinon was attributed to Joan, but testing has debunked this (the bone actually belonged to a mummy, of all things). This webpage, managed by the St. Joan Center, has a lot of great information on some possible relics of Joan's that may be in existence, such as a rock that she prayed on and kissed and other things associated with her. I encourage you to check it out if you are interested in history and relics. St. Joan of Arc, pray for us, and pray for France! It sometimes happens in the history of the Church that when doctrine and spirituality become skewered by errant teachings, or when catechesis is incomplete, bizarre practices start to pop up. As a modern example, we could cite the horrendous practice in the Philippines of crucifying live individuals during Holy Week. Sometimes these practices are alleged to be supernatural in origin, such as the "Eucharistic miracle" at Medjugorje (see here). In both of these examples, what passes for piety or a miraculous sign from God are really nothing other than the results of poor catechesis, disobedience or an overactive imagination. 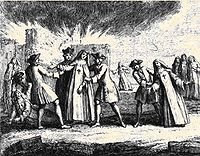 A similar occurrence happened in Paris around 1730 in what must rank as one of the most bizarre movements in the Church's history - the Convulsionaries. It is not accurate to call the Convulsionaries heretics, although they were loosely connected with the Jansenists of Port-Royal; rather, their movement should be seen as an example of bizarre, misguided piety, much like the Flagellants of the 14th century. The origin of the Convulsionary movement is the cemetery of St. Medard in Paris, where a certain deacon (who was a fanatic and sympathizer with the Jansenists) was buried. Soon after the deacon's burial, a girl claimed to have been cured of blindness. Archbishop Vintemille of Paris examined the "miracle" and found it a complete hoax, which he asserted the Jansenists were propagating as a means of giving divine sanction to their doctrines. Nevertheless, despite the bishop's condemnation of the miracle, multitudes began seeking out the tomb in hopes of being healed. More miracles were reported, but they were not miracles in the way we are used to thinking of them; in fact, we would say they were not miracles at all, but hallucinations or worse. Consider the example of the Abbé Bisherand, a man who was born with one leg much shorter than the other. In hopes of being cured, he prostrated himself on the tomb and laid there for quite some time. His leg did not lengthen, but he insisted that he felt a sensible elongation of his leg, even though there was no physical healing. He claimed that the leg was in fact healed, and that it felt healed, but that this healing was invisible to others. This "sensible" elongation was touted as miraculous, and visits to the St. Medard graveyard increased. Other persons began laying on the tomb and experiencing violent convulsions (from whence they were called Convulsionaries); some were reportedly levitated while convulsing. Most of those who experienced these convulsions were females, and we are told that their contortions and agility were astonishing, and often indecent. This phenomenon became the talk of Paris; the streets to the cemetery were constantly crowded and the press of Paris published articles either for or against the Convulsionaries. The Archibishop of Paris thought the matter so serious that he published a long pastoral letter warning the faithful against it, but to no effect. Finally, King Louis XV ordered the graveyard closed, the entryways blocked up and the roads leading to it guarded by soldiers. This did not halt the Convulsionary movement, however. Persons sneaked into the graveyard and removed dirt from the deacon's tomb, and persons laying on the particles of dirt experienced the same contortions and alleged miracles. Regarding these "miracles", they began to look less and less like anything miraculous and more like some circus freakshow - people, without harm, swallowing stones, knives, or eating fire; some, like in the Philippines, crucifying themselves and alleging no pain; many Convulsionaries voluntarily underwent many other tortures, all while exhibiting the most serene expressions and claiming they felt no pain. This went on for almost thirty years until it died out in the 1760's. "The first scene was that of the crucifixion of the sister Rachel and the sister Felicité, two women from thirty to forty years in age, who were moved, as they pretended, to exhibit this lively image of the passion of our Saviour in a mean lodging in Paris in August, 1759. These two wretched creatures were actually nailed to two wooden crosses, through their hands and their feet, and continued fastened to them for upwards of three hours; during this time they sometimes pretended to slumber, in a beatific trance, and, at other times, uttered a quantity of infantine nonsense and gibberish, asking for sweetmeats, and threatening and fondling the spectators, in lisping accents, and all the babyish diminutives of the nursery. The second exhibition...consisted in the crucifixion of the sister Francoise and the sister Marie, -and a great deal of beating and thrusting with swords on the bodies of some of their unfortunate apprentices...Francoise remained upwards of three hours on the cross; which was shifted into a great variety of postures during this period: but the sister Marie wanted faith or fortitude to edify the beholders to the same extent - she shuddered at the fastening of the nails, and, in less than an hour, fairly cried out that she could stand it no longer, and must be taken down: she was unfastened accordingly and carried out of the chamber in a state of insensibility, to the no small discomfiture of her associates. The spectacle was concluded with a still more unlucky performance. The sister Francoise had announced that god had commanded her on that day to burn the gown off her back, and had assured her of much comfort from the operation. After a great deal of grimacing accordingly, fire was actually set to her skirts but, instead of appearing to experience any delight, the failing saint very speedily screamed out in terror and they were obliged to pour water upon her petticoats and carry her off half roasted - half drowned - and utterly ashamed of her exhibition. Those horrible and degrading practices had been going on in the heart of Paris for upwards of twenty years...a few profligate priests were supposed to be at the bottom of the contrivance, but all the agents, or victims, rather, were women" (taken from The Church in France by Charles Butler, Clarke & Sons, London, 1817, pp. 132-142). The entire month on this blog is dedicated to France - all posts from now until June 29th, the 4th anniversary of the founding of this blog, will feature articles relating to Catholicism and France or French culture. We begin this series with the important but much neglected Masonic conspiracy known as the Affaire des Fiches. In 1904, the French government of the Third Republic was in the hands of President Emile Combes, who served from 1902 to 1905. Besides the usual fractious divisions within French politics of the time between Royalists, Republicans and Bonapartists, there was the added division between clericalists and anticlericalists, the latter being generally opposed to the Catholic Church and in particular to the establishment of the Church in France, calling for a total separation of Church and State. President Combes, an ex-seminarian, was a dedicated anticlericalist, and also a Freemason. The Affaire des Fiches concerned the efforts of the President of France to use his political authority and his contacts with the Freemasons to undermine the efforts of the pro-Church clericalists by "Republicanizing" the government; i.e., seeing to it that only Republican anticlericalists were promoted within the government bureaucracy. 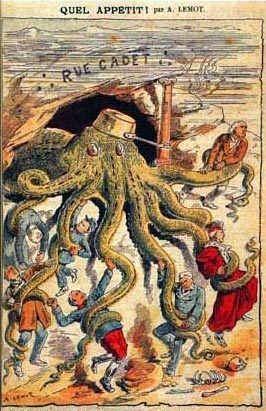 To a lesser extent, this had already begun under Combes' predecessor, René Waldeck-Rousseau (1899-1902), who with his Associations Bill of 1902 formally sought to promote only those who held Republican principles to high posts in government. Combes' plan proposed to go much further, however, expanding the spying down to lower level army officers and throughout all levels of the bureaucracy. Such a scheme required data gathering on a massive scale. Even today such a plot would take a tremendous amount of spying, let alone in 1904. To accomplish this, President Combes drew upon two sources: the resources of the Masonic lodge network within France, and the cooperation of his subordinate and fellow Freemason, General Louis André, Minister of War and a very militant anticlerical. Through the influence of André, Masonic lodges throughout France secretly gathered data on government officers, especially army officers, to determine if their sympathies were Republican or anticlerical. This was done mainly by noting who was a regular Mass attender and who was not. This data, written on slips of paper, was then forwarded to General André. Samples of these slips reveal the extent to which the Masonic networks spied upon these suspected Catholics. On the cards and set up, we could see entries like "VLM" for "Go to church" or "VLM AL" for "Go to church with a book." The cards are not content to report only the facts as reflected in the designations of "clerical clericalizing", "cléricafard", "cléricanaille" (sometimes using the more derogatory phrases "black cap thoroughbred", "jésuitard ," "great swallower of God," " old skin closed to our ideas"), but also also relate to privacy or family of the officers: "Civil Suit in processions," "attended Mass first communion of his daughter," "Member of the Society of St. Vincent de Paul ," "To his children in a jésuitière", "keeps a cross in home", "has a very wealthy woman," "Lives with husband and wife an Arab woman." Records such as "Has received the blessing of the pope at his wedding by telegram" demonstrate that even telegrams and mail was spied on. Once the data was collected, these slips (fiches) were sorted into two piles termed the Corinthe and the Carthage. The Corinthe consisted of officers with atheist or agnostic beliefs and were scheduled to advance; the Carthage consisted of practicing Catholics who were to be intentionally held back from promotion. A scam that big cannot go unnoticed for long; indeed, it was soon discovered, betrayed by one of the Masons themselves, Jean-Baptiste Bidegain, assistant secretary of the Grand Orient of Paris. Bidegain contacted Jean Guyot de Villeneuve, a nationalist member of Parliament. Though a high-ranking Mason himself, Bidegain was appalled at the whole scheme and provided Villeneuve with enough evidence to bring the matter to the public's attention. On October 28th, 1904, Villeneuve exposed the plot on the floor of Parliament armed with letters, correspondences between lodges,and copies of letters transmitted to General Louis André. An investigation followed, in which over 3,000 slips of paper (fiches) were discovered with such information as described above. The public was outraged at the affront to religious freedom and privacy. Even anticlerical groups denounced the affair. General André immediately resigned in disgrace; the scandal went all the way up to President Combes, who attempted an unconvincing defense but was unable to stop his government coalition from collapsing. His socialist allies deserted him, and amidst increasing furor, he resigned the presidency on January 17th, 1905. Interestingly enough Bidegain, the Mason who had tipped off Villeneuve, ended up leaving the Masons and publishing many articles against their influence in France. He became known as the "Judas of the Grand Orient" among the Freemasons and ended up committing suicide in 1926. Despite the fall of Combes government and the popular outcry against the Masonic conspiracy following the Affaire des Fiches, it was not enough to defeat the rising tide of anticlericalism. Almost a year later, on December 9th, 1905, the French Chamber of Deputies passed the Law on the Separation of Church and State, officially disestablishing the Catholic Church in France and establishing secularism.